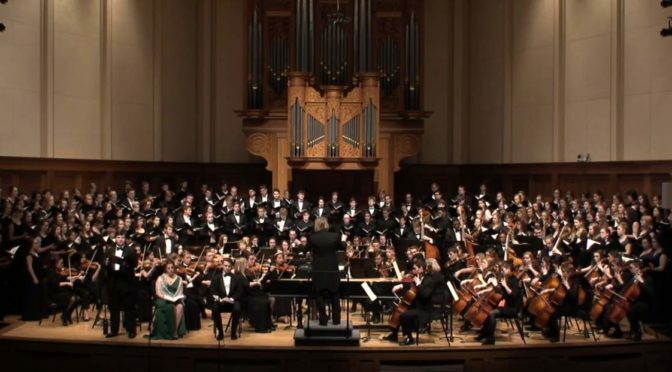 Conducted by Phillip A. Swan, Lawrence Symphony Orchestra, Viking Chorale and Cantala Concert Choir perform The Creation (German: Die Schöpfung), an oratorio written between 1797 and 1798 by Joseph Haydn (H. 21/2). It is considered by many to be the Austrian composer’s masterpiece. Soloists: Emily Birsan (soprano): Gabriel, Eva; Luke Honeck (tenor): Uriel; Evan Bravos (bass): Raphael, Adam. Recorded on April 29, 2016. The oratorio is structured in three parts, the first dealing with the Creation of the universe and the plants, the second with the Creation of the animals, and of man and woman, and the third with Adam and Eve in Paradise, showing an idealized love in harmony with the “new world”.